So you’re the novice showrunner of a critically-acclaimed anthological detective drama heading into your second season, with an entirely new cast. You’ve got Hollywood ringers in your cast and a whole lot of expectations. You can go the True Detective season two route, and disappoint your fans and leave critics smirking that True Detective’s flaws were always there, they were just hidden by a few great actors and some fancy directing. Or you can go the Fargo season two route, premiering tonight on FX at 10 pm, and prove that the phenomenon was not just a lark. A great TV show is somewhat of an incredible stroke of luck. A great TV show reinventing itself almost entirely, with a new story in a new time period with a new cast, and remaining great? Well, that’s something more like a miracle. But Fargo is all about miracles. "And then, Molly, that's when the man started up his wood chipper..."
Each episode of the second season of Fargo, like the movie that inspires it, begins with a disclaimer of sorts: "This is a true story. The events depicted in this film took place in Minnesota in 1979. At the request of the survivors, the names have been changed. Out of respect for the dead, the rest has been told exactly as it occurred." That is, of course, an untrue statement. Fargo showrunner Noah Hawley likes to say the based-on-a-true-story claim grounds the series, forces it to be more believable. Ah, but that’s not a true story. either. Fargo hews closer to magical realism than real realism. In Fargo, Minnesota and South Dakota are fairytale kingdoms where the plagues of crickets fill supermarkets; where fish rain from the sky; where UFOs cause car accidents; where coincidences converge with such a thick fury that they feel inseparable from fate. 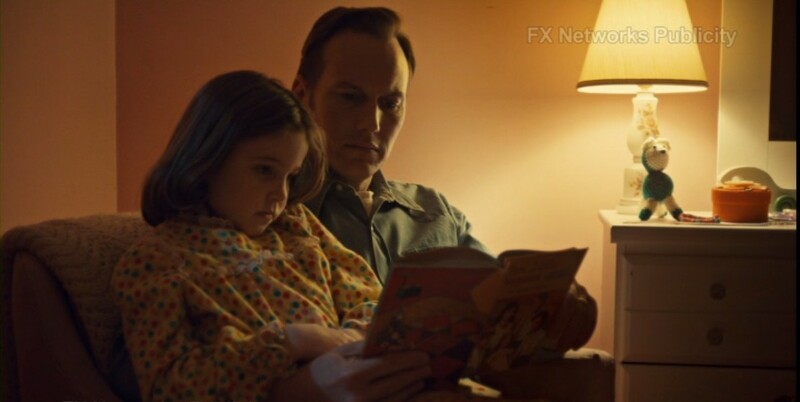 So it’s fitting that the first time we see Lou Solverson (Patrick Wilson, a performance that channels the simple decency of Andy Griffith), it’s when he’s sitting in a rocking chair, reading a bedtime story to his child Molly. It’s a story published in 1880, about a simple family, born into poverty, who find themselves going on all kinds of adventures. This scene is presented in natural split screen, the camera showing the room where Lou read to Molly (who grows to become the hero of the first season) and Lou’s wife Betsy putting away clothes, then leaving to answer the phone. It’s bad news. The essence of the series are moments just like this, where tension simmers between storybook simplicity, humdrum everyday life and violent brutality. You have a Waffle House — about as iconic small-town Americana as you can get — and the blood is pooling like maple syrup on the table, blending in with the spilled vanilla milkshake near the easy-squeeze bottles of ketchup and mustard. It echoes that iconic Fargo image of blood splattered across pure white snow. Fargo finds beauty in violence in the same way Hannibal did, but with the opposite palette. Hannibal painted with shades of dark red against black, where Fargo splashes bright red against white. The cinematography is gorgeous, and the style underlines the symbolism. The opening credits sequence of the first three episodes features split-screen scenes of our heroes making their way through the methodical rituals of everyday life — breakfast with the family, curling hair to get ready for the day, driving to work — before the mythic violence of the series begins to intrude. It isn’t the first time violence has intruded into this community. A few episodes into the season, Lou delivers a you-better-fess-up monologue that matches the tone of a concerned father rather than an angry cop. But his words describe the death and violence he’s seen in Vietnam. Setting the show in the late '70s allows the wounds of Vietnam to hang over the narrative. Who served, who saw combat and who didn’t defines characters and their motivations. With this backdrop, it would be easy for this show to laugh off small-town Minnesota as naive. It doesn’t. Fargo is a far cry from modern police dramas like The Wire and True Detective, which like to sneer at the notion that anything can be simple, or anything can be truly solved. Fargo is something much less cynical. It's not anything close to a true story, but stories don't have to be. Instead, it’s closer to a mythic storybook, where dragons must be slain and evil kings must be defeated. But unlike most TV series these days, there are true heroes in Fargo, and there are endings that conclude with They All Lived Happily Ever After — or the closest you can get to in rural Minnesota. Sometimes, after all, a storybook ending just means locking up the bad guy, closing the case, and then slipping into bed with your husband to chat about three-cent stamps.